One truly thoughtful NPWT product is all you need. Carilex VT•200 for the powerful healing you deserve. Here at Carilex, our motto is "caring makes the difference". The care for our patients has always been the primary drive for us to strive for excellence. Taking care of patients can be stressful, that is why an intuitively smart product can make a world of difference. For far too long, NPWT has been understood as a difficult complication, numerous calculations need to be conducted before a caregiver can decide the right product for the patient. Carilex has determined to provide a more intelligent solution for wound therapy -- We present VT•200, the truly thoughtful, easy-to-use negative pressure wound therapy unit for large wounds. It is the only NPWT product you will ever need. Less is much much more. NPWT is a proven solution to provide exceptional wound therapy for patients. As a part of a comprehensive negative pressure wound management, VT•200 is simple to use, whisper quiet and incredibly powerful. It is compatible with multiple wound sizes. 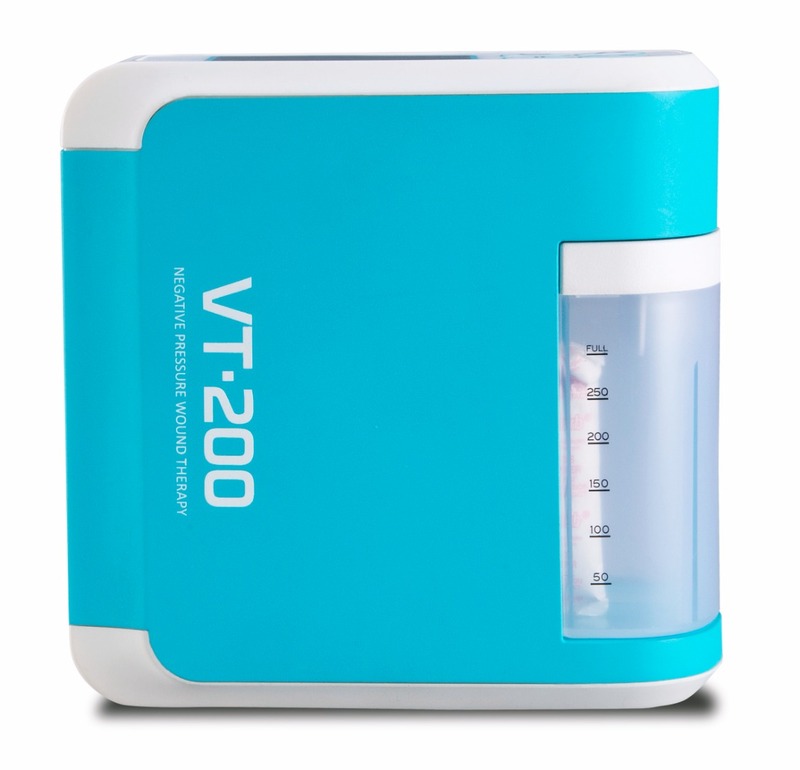 No more various products for various stages of care, VT•200 is the only one you will need. VT•200 offers continuous and intermittent modes, individually adjustable pressure settings, and outstanding high fluid removal rate. The portable lightweight design with disposable canister and carrying bag means it is extremely clean and convenient for everyday use. VT•200 is designed with extraordinary suction power specifically for larger wounds. Combining with the XL VT Dressing, VT•200 creates the perfect theraputic enviornment for wounds like abdominal wounds to heal. With teams of research and design experts across three continents working tirelessly throughout the years, VT•200 proves to be an extraordinary product that can only be produced by people who care -- and Carilex cares deeply in what we build. We care about making your life easier, we care about making a difference, and most importantly, we care about giving you the care you deserve. * For complete indication for use please refer to the VT•200 user’s manual. Do not operate this product before reading the manual thoroughly. The application of negative pressure helps maintain a moist environment for the wound bed, while removes excess fluids and exudates, infectious materials, tissue debris, and reduce tissue edema, thus may promote wound healing. It may be beneficial for patients with traumatic and dehisced wounds, partial thickness burns, chronic wounds such as pressure ulcers, diabetic foot ulcers and venous leg ulcers, acute wounds and flaps and grafts. With continuous and intermittent operation modes, individually adjustable pressure settings, and disposable collection canister in multiple sizes, VT•200 provides all-around wound therapy that fits every stage of needs. Long battery life up to 24 hrs, for uninterrupted therapy and portability. VT Dressing Kit is indicated for patient who benefit from wound management therapy via the application of negative pressure wound therapy for removal of fluids and excess exudates, infectious material, and tissue debris which may promote wound healing. Comes in 3 different sizes, the VT Dressing Kit delivers superior performance by maintaining prescribed negative pressure at the treatment area. VT Dressing Kit is carefully engineered to promote the most effective healing results while stringently tested for optimal comfort and safety our patients needed. Suitable for all wound size and types. Including XL for abdominal wounds. VT Canister is an ergonomically designed, translucent, lightweight fluid and exudate collector. The sophisticated three layer filter system work as a barrier to avoid cross contamination and odour. With reservoir container gel sachet to solidify collected fluid, VT Canister allows safe and hygienic disposal after use. Integrated canister release latch for single handed operation and easy-to-read fluid level markers were designed so operating it will always be a breeze. VT Canister comes in 3 different sizes, suitable for various stages of care. Suitable for patient in every stages of care, larger fluid capacity for cost efficiency. For easy single handed operation.